Moonsetter Gordon Setters is not just a kennel, but a family involved in raising, training, hunting and competing with our dogs. Our Gordon Setters are part of our family, and because of this, most of our interests revolve around them. The foundation of Moonsetter Gordon Setters began with our fourth Gordon, "Belle", otherwise known as Ch. Timberlane Going in Style JH. Equipped with an enviable pedigree that contained many prominent bench champions of their era, Belle's pedigree also contained several dual-champions and titles from AKC field and performance events. We couldn't have asked for a better foundation with which to build on, and the essence of Moonsetter Gordon Setters has always been to combine the "classic looks" of champions past, with the "contemporary style" of today's multi-purpose performer. We believe the Gordon Setter should be a devoted, loving, and biddable companion, and since we place the temperament of our Gordon Setters as our highest priority, we also know they make excellent family members and canine citizens. With over 45 years in purebred dogs, our experience and dedication has given us the tools we need to produce quality Gordon Setter puppies for virtually every interest. 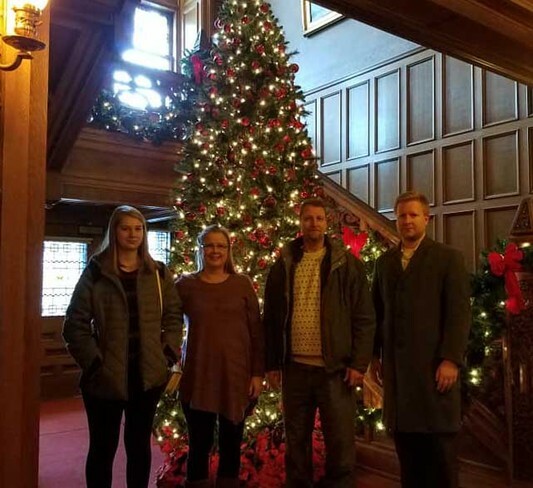 When our children were growing up, we loved our time attending all of the events that made up their busy lives (concerts, marching band, sporting events, etc.) We also took an active role helping our area youth, serving as both Boy Scout and Venturing leaders with both of our kids. Our love of the outdoors was always prevalent in our every-day lives, and we still enjoy camping, fishing, hunting, showmobiling and horseback riding. We both participate in the life of our church, and take our faith very seriously as well. With our children both working on post-graduate studies, our life has slowed down quite a bit. Chuck is retired from a career in law enforcement, and Heidi, after years of running the kennel and a busy grooming salon, now works as their church secretary. After growing up in a home filled with “all things dog”, our daughter Olivia is completing her degree in Companion Animal Science, with an emphasis on Canine Rehabilitation. She will eventually become the face of Moonsetter Gordon Setters, and we couldn’t be happier knowing that someday, the Moonsetter legacy will continue in her capable hands. As members of the Gordon Setter Club of America, we've taken an active role in the future of our Breed. 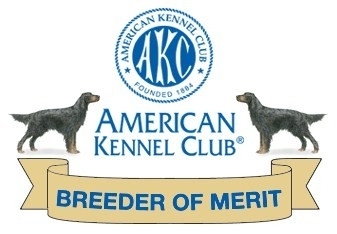 We are also recognized "Breeders of Merit" with the American Kennel Club, something we take great pride in. Our commitment to the Gordon Setter is total and complete, and one we take very seriously.